LG OLED55B6V review | What Hi-Fi? LG’s 4K OLED screens have hit the jackpot this year. We’ve loved every screen we’ve come across from its OLED range, from the gorgeous £5000 OLED65E6V to the £2999 OLED55C6V. Now we come to the LG OLED55B6V, from the most affordable range in LG’s 2016 OLED line-up. It’s still a fairly expensive TV, but if you’re looking for a great screen that will give you all the technological highlights and streaming features without breaking the bank, this is definitely one for your shortlist. The LG OLED55B6V looks lovely. An elegant stand design makes it look as though the screen is floating, and there’s barely a bezel surrounding the 55in screen. The square metal stand will fit on any AV rack. The screen is slim, but if you’re planning on wall-mounting the 55B6V, be aware that the bottom half of the set bulks up to accommodate 40W of amplification, Harman Kardon speakers and all the TV’s connections. You get LG’s Magic Remote in the box, a cursor-wielding remote control that fits snugly in our hand. The point-and-click function can take a few moments to get used to, but the buttons all respond instantly and using the handset becomes second nature after a while. From the moment we turn this LG 4K OLED on, we’re sucked into the deep pools of pitch-black darkness and glowing brights. You’d think we should be used to it by now, but we’re still amazed at just how strong the OLED’s contrast is. Colours pop against the velvety rich darkness and even if there aren’t big swathes of dark on the screen the sense of depth it gives to pictures is astonishing. But what impresses us with the 55B6V – indeed, LG OLED screens in general – is how that lush contrast sits alongside layer upon layer of subtlety. The LG B6 OLED is a 4K HDR (high dynamic range) screen that adheres to all the standards set by the UHD Alliance for Ultra HD 4K resolution and HDR, but LG adds Dolby Vision on top of this tech. But whether you’re streaming Daredevil (Netflix) or The Man in the High Castle (Amazon), you get the same results: the 55B6V looks stunning. It’s insightful enough to pick out detail and outlines in shadowy scenes – and there are a lot of those in both these shows – while keeping those intense blacks in check. Even when Daredevil is a blur of fists in a dark alley, you can pick out the reds of his suit. Textures of clothing and strands of hair are clearly and crisply detailed without the picture looking overly sharp; skin tones look entirely natural, wrinkles and all. The full force of 4K smacks you in the face when viewing the 4K disc of Mad Max: Fury Road. The LG manages to convey the grittiness of the rough terrain, the scratchy and dusty texture of the sand, the oily grime on Furiosa’s face and the cracked paint on the war boys. The violent bursts of red flares and the vivid blue skies aren’t simple blocks of colour – there are subtle variations in the rich hues. There’s a great sense of three-dimensionality to the characters. The black depth and the subtlety within the colours ensure that you get a very impressive and tangible sense of dimensionality. There’s just a hint of motion blur when the action gets heavy or there’s a slow panning scene, but tweaking the de-judder and de-blur settings tends to smooth over those hiccups without adding any discernible processing effects to the picture. The colours can seem a touch effusive next to the more sedate palette of the Samsung UE55KS9000 (£2000), but it never looks unrealistic. The LG masterfully conveys the gradients in shading when it comes to grassy fields, metallic textures, and even the various shades of grey in The Man in the High Castle, which can be a muddled mess on a less insightful screen. An LCD screen might have cleaner, starker whites, but the LG’s whites glow invitingly when placed next to such deep blacks. Glints of sunlight on metal look wholly realistic and captivating. Lamps and light sources give off the right amount of warmth and intensity, and you can even see small details and different colours within the piercing light. A Blu-ray of X-Men: Days of Future Past reveals the innate differences between the LG B6 and its rival, the Samsung 55KS9000. The Samsung has a more clinical approach – white shirts and skin tones look stark and startlingly realistic. The LG, though, shows the softness of a folded collar, the OLED drawing you in more, completely holding your attention to what’s on screen. Standard and Full HD TV channels take the expected knock when it comes to absolute detail and clarity, but that engaging balance of colours and subtlety stays in place to draw you into whatever you’re watching – even The Tipping Point and blurry reruns of MacGyver. The LG sounds good too. The Harman Kardon speakers deliver a satisfying amount of body, there’s warmth and richness to voices and sound effects, and it’s a fairly comfortable listen. There’s enough detail and clarity that you could get away with listening to the TV’s own speakers when watching shows, without the immediate need to add a soundbar. Still, for a TV at this price, you may want a more cinematic and involving sound over time. Pairing the OLED with the Q Acoustics Media 4 soundbar (£330) or the Geneva Model Cinema soundbase (£550) would give you greater scale, more detail and more excitement. We can’t talk about an LG TV without mentioning WebOS, its much-lauded smart TV interface. Now in its third generation, the colourful card-launcher remains an inviting, unobtrusive and easy-to-use interface. Press the home button on the remote, and the cards pop up at the bottom of the screen – so you never have to exit what you’re watching to select another app or source. Then, simply hover the remote-cursor over the card/app you want and click to launch. You can shuffle the cards around in an order that works best for you, and sorting your favourite and most-often used apps makes launching them even quicker. 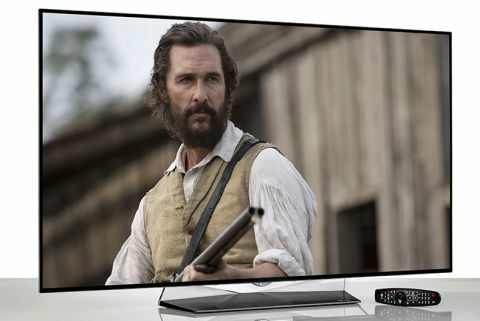 The LG OLED55B6V has Netflix and Amazon video for 4K streaming. You also get catch-up services such as BBC iPlayer, ITV Player, All 4 and Now TV, as well as anything else you can download from LG’s content store. The wi-fi connects swiftly and is stable, although we would recommend using the wired ethernet connection for even greater stability. Around the back, you’ll find four HDMI inputs (all adhering to HDCP2.2 and HDR standards), three USB ports, an optical output and both Freeview HD and Freesat tuners. Everything, then, that you need for watching standard, Full HD and 4K telly. It’s very difficult to take your eyes off the LG OLED55B6V, and it's a welcome addition to the (slightly) more affordable end of the OLED spectrum. Its gorgeous screen continues to show just how far LG has come with OLED screen technology, combining those signature deep blacks with plenty of insight and detail to challenge, well, pretty much every other TV on the market. We could easily see ourselves choosing this screen to be the centrepiece in our home.